Wow! TRANSFORMERS® fans can experience the most amazing toy this holiday season with the Ultimate Optimus Prime, Dark of the Moon™ MECHTECH™ Weapons System by Hasbro®. My boys (and even my husband) love the Transformers and their favorite is the protector of good and leader of the TRANSFORMERS®, Optimus Prime. I was immediately impressed with this toy for children ages 5 and up because the Ultimate Optimus Prime® is the absolute biggest Optimus Prime® toy available. In fact, when it is extended to full length it is over 22 inches…..you should have seen my son’s eyes light up with amazement! It is action packed as it features electronic lights and sounds including “blasting battle sounds.” My six year old son was thrilled to discover the glowing weapon lights. He immediately got to work transforming Optimus Prime in robot mode, power mode with extending wings and finally, truck and trailer mode. The “Ultimax Super Cannon” flips into action for the ultimate in battle and this set features the “latest battle enhancement equipped by Transformers® warriors” called the MECHTECH™ Weapons System. What does all of that translate to for us moms? 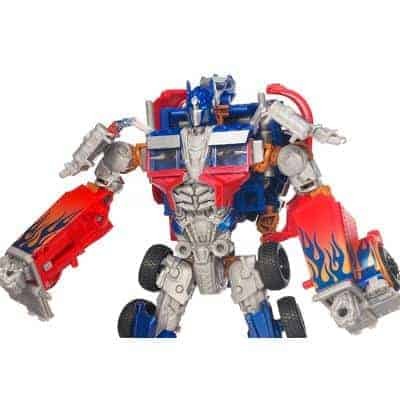 Well, according to my son the Ultimate Optimus Prime® Autobot® is, “the coolest TRANSFORMERS® toy ever created in the entire universe.” I would say that about sums up this wonderful toy straight from the mouth of a TRANSFORMERS® fan! You can purchase or learn more about MECHTECH™ TRANSFORMERS Dark of the Moon-Ultimate Optimus Prime® Toy (SRP $79.99) as well as the entire MECHTECH™ collection by visiting the Hasbro® website. I love transformers! Looking for a Christmas present for my little cousin and this looks like the perfect fit.